Salt Lake City – Adobe Systems Inc. didn’t waste any time at its annual Summit conference in telling its audience of marketers that their field is experiencing a sea change, and marketing must become of central importance to the organization if it’s going to thrive. 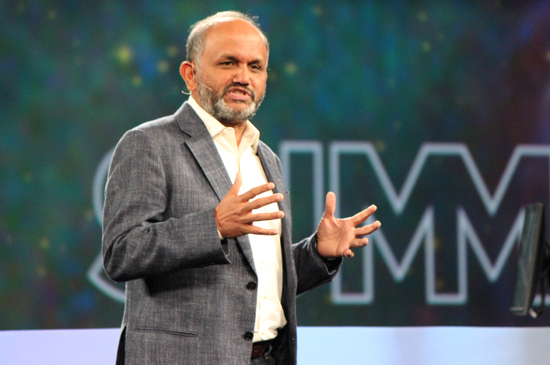 Opening the conference that focuses on its ever-expanding Marketing Cloud solution, Adobe CEO Shantanu Narayen started by reminding the 7,000 attendees that Adobe only entered the digital marketing space five years ago. By contrast, its portfolio of creative products are much more established – Adobe Photoshop turned 25 in February. Adobe CEO Shantanu Narayan says marketing faces a sea change. In those few years, Narayen said he’s seen how the Internet age caused a disruption to the marketing industry. Bringing content online meant that marketers had to reach out and collaborate with peers in sales, support, and the IT department to accomplish their goals. Digital technology meant marketers had to prove the return on investment for their creative output and the practice became as much about science as it was about art. But Narayen says that disruption is only the beginning. Referencing the Internet of Things trend that is creating customer interactions with brands on devices from smart watches to vending machines, Narayen says the product output by a company to those devices is synonymous with their brand image. He points to ride sharing app Uber as an example, saying Uber understands that its mobile app is its business. Bolstering the point, Brad Rencher, senior vice-president at Adobe, also used his time on stage to drive home the message of a profession in the midst of transformation. 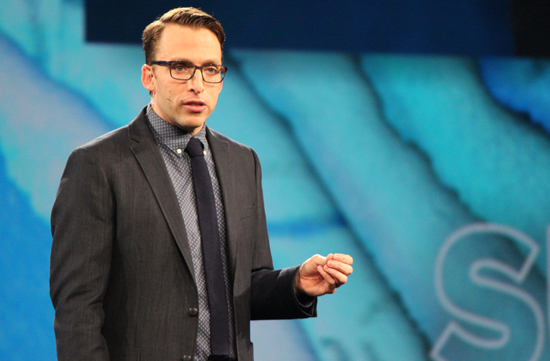 Brad Rencher, SVP at Adobe, says marketing is becoming central to the enterprise. That sentiment rang true for Jennifer Polk, a research director for Gartner for Marketing Leaders. Brands that are succeeding in the marketplace right now are doing so because of the experience being created around their products, she says. For Ray Wang, principal analyst at Constellation Research, Adobe’s message can all be tied back to commerce. The path to creating a product that exudes the company brand isn’t an easy one, Adobe executives recognized throughout the morning. But in order to get there, organizations will have to ensure marketing is central to all of its activities – not just one department among many. “Turning your product into marketing puts marketing at the centre of every single business,” Narayen says. Rencher later reinforced the point, saying marketing is “the epicentre of transformation” for organizations. This is driven by the need to please customers. “I need you to know me. I need you to love me. Is that to much to ask as a consumer?” he said. But the pronouncements are a bit too eager for analysts. Gartner’s Polk frames Adobe’s statements as more of an overarching message of where marketing is headed in the future. Ahead of introducing a slew of new updates to the Marketing Cloud products, Rencher shared the principles that he sees as guiding the product. Comprehensive: “It’s not just about any one thing. It’s about the breadth and totality of all these in a single place,” he says. The statements reflect that Adobe’s marketing cloud – as Narayen reminded us is still a young product – represents a series of acquisitions made by Adobe and pooled into one solution, Wang says. It’s still working to integrate all of those companies into one platform. “Getting to one data model, one work flow, one engine, one identity, and one experience is the goal,” he says. For Polk, the principles reflect what she looks for as an analyst that evaluates software on the behalf of clients. She also points out that while Adobe doesn’t directly deliver all the capabilities a marketer might need itself, it’s made partnerships to cover the blind spots. “The idea that you’ve thought of a comprehensive solution and you’re either directly providing it, or acting as a hub… that’s important and there’s a few ways to get there,” she says.